"Short lived like a butterfly" is an audiovisual performance that uses unique electronic instruments, delicate and unstable, built by the combination of assorted materials found at electronic debris, using Circuit Bending. These devices when played together generate electrical signals that reach a wide range of frequencies (from audible to ultrasonic). Depending on the combination of these signs, to locate its source is impossible because the space is filled with this mass of sound that resonates in our body. The instruments are unstable and sometimes they can simply stop, creating a constant risk during the presentation. All these malfunctions or glitches turn part of the improvisation. Finnish circuitbending & hardwarehacking crew will show you some recent projects, and play some dirty and experimental music. Christiano will also be teaching a workshop on hardwarehacking and circuitbending. Through the technique of circuit bending we can create our own audiovisual instruments. 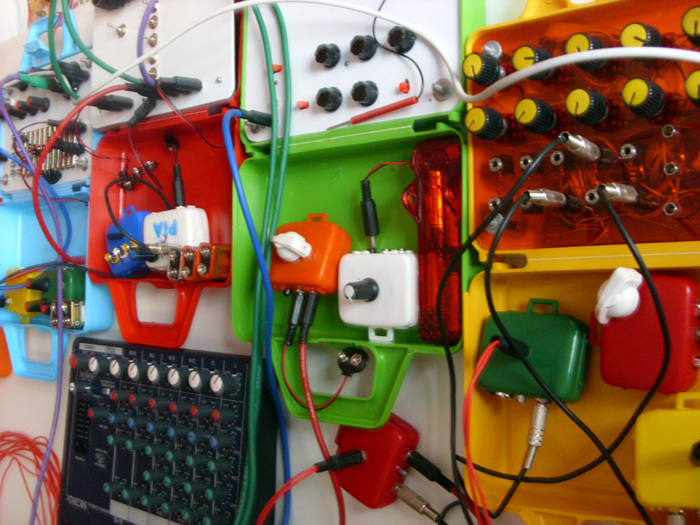 Using toys, broken electronics, recycled electronic parts you can create a lot of new sounds and images. Bring your eletronic device, like as: old toys, casio keyboards, guitar effects, radios, walkie-talkie, security cam, video mixer, assorted recycled electronic parts. Workshop is free, though some money will be collected to get food. Cristiano Rosa works with experimental music since 1989, through feedbacks, smashing loop tapes and metal percussion found in garbage. 1990-1999 he collaborated with other experimental artists in expositions, installations and performances. 2000 he had a solo project called Jazzymenow and made live p.a. at Goethe Institute Porto Alegre. 2001 founded a cassette label: Crackerjack. 2005 started your research in Circuit Bending, Hardware Hacking and new forms to produce audio and video through handmade devices. 2006 made his first concert based on handmade devices and a few synthesizers with short movies. 2007 he play together with artists as Zbigniew Karkowski, Colorir, Duplexx, Cristof Kurzmann, LiveNoiseTupi, Andre Wakko, Julie Rousse, Penelopex, Klass Huebner, City Harvest Black, Colonel Pamisan, Mauro Martinuz. Started the Circuit Bending Brasil group which today has almost 200 members. Organised the first Circuit Bending workshop in Rio de Janeiro, Brazil at Plano B. 2008 organised Circuit Bending Brazil Tour, with concerts and workshops at Rio de Janeiro, São Paulo, Recife, Salvador, São Carlos and did a Circuit Bending Euro Tour at Zagreb, Krizevci, Ljubljana and Berlin in collaboration with a local artists. 2010 started a South American collective Sudamerica Experimental with Chileans and Argentinians. The project began with the intention of becoming a platform for exchange and collaboration between projects related to musical and artistic experimentation in Latin America. In the 3 years played concerts and organised circuit bending and hardware hacking workshops in 12 Brazilian states with more than 700 participants.